Learn to use metaphors and stories to engage attention, inspire action and be a more persuasive leader, trainer, salesperson, coach, fundraiser or speaker. If you’re looking for a master storytelling coach and trainer who can teach your people how to tell THEIR stories in a more effective and engaging manner, you’ve come to the right place. This is not theory based education, this is practical application. Do you want to write a persuasive speech? Do you want to get your point across in an engaging and entertaining manner? Do you want to sell more of your product or service? Do you want to influence and inspire people to achieve better results? Are you stuck in PowerPoint purgatory and want a way out? Preview this program in the Media Gallery. What sets The Story Theater Method for storytelling in business apart? Great stories are more like a movie than a report. Like a good movie, they are crafted to stimulate an emotional as well as a logical response. They are engaging and effective because they activate the listener’s imagination. You haven’t really connected with your audience until you’ve told a story. Just telling a story however is not enough. You’ve got to know what you’re doing to be effective. If it’s the wrong story, told in a rambling, all-over-the-place manner, without a strategic point that is well branded, it can be a waste of everyone’s time. Doug will make you a better speaker and storyteller. Doug Stevenson has been described by his clients as a master storyteller. Unlike many talented performers, however, Doug’s ability to show you how to be a great storyteller is what has made him a sought after speaker, trainer and coach. He’ll show you how it’s done and within a very short time, have you on your feet telling stories that have the power to inspire and influence others. Corporate Storytelling in Business is Serious Business – It Gets Results! Doug’s form of storytelling for business professionals is a blend of the practical and the theatrical. 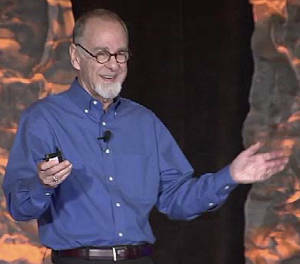 As a result of utilizing the Story Theater Method, speakers, trainers, leaders, salespeople, entrepreneurs, fundraisers and business professionals at all levels give more interesting and memorable presentations. They make something happen! Doug challenges people. He speaks the truth. He tells it like it is. As a result, leaders learn to lead when they speak, salespeople sell more and speakers tell stories that change people’s lives. Contact Deborah Merriman to check Doug’s availability and fees at 1-719-310-8586.